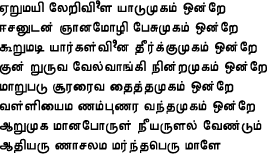 For the past six months, I have been continuously singing Kanthar Sashti Kavasam everyday, as instructed by Lord Murugan in one of my earlier dreams (See: "Bakthi - Kanthar Sashsti Kavasam: Sing"). However, as the months passed, it became increasingly difficult for me to sing Kanthar Sashti Kavasam everyday. My job, personal life, and family, would make singing with a peaceful mind very challenging. Often, I would go to my car late in the night and sing the Kavasam because no-one (i.e. parents) could distract or request favours from me. As a result, I found myself very drained in terms of my energy level. My memory and job performance was poor due to lack of sleep. My time was constrained due to continuous and time-lengthy requests by my employer and family to perform certain tasks. Yet, by God's grace I still was able to continue my duty of fulfilling Sri Skanda's request for 6 months continuously everyday. This week (on July 24th), I completely forgot to sing Kanthar Sashti Kavasam, and so ended the six months of continuous singing. I was so overwhelmed by work and family pressures, that this duty slipped my mind. I was also exhausted and hence, went to sleep. Please inform me the mystic significance of the six faces! Oh Primal One! Oh Lord residing at the Hill ThiruvaaNamalai! After He sang the entire Thiruppugal song into my right ear, Murugan then vanished into thin air. I then awoke. I thought deeply about this event in relation to the past hectic months and arrived at the only sensible meaning of this dream. 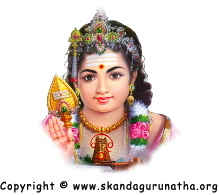 Lord Kantha has given me another instruction  to sing Arunagirinathar's Thiruppugal in place of Kanthar Sashti Kavasam. Moreover, this small eight-line song is equivalent in its potency and efficacy to the 240+ line kavasam. From that day onwards, I sing this song everyday. I do, however, continue to sing Kanthar Sashti Kavasam but only on festive occasions such as during the Kanthar Sashti virutham (fast).